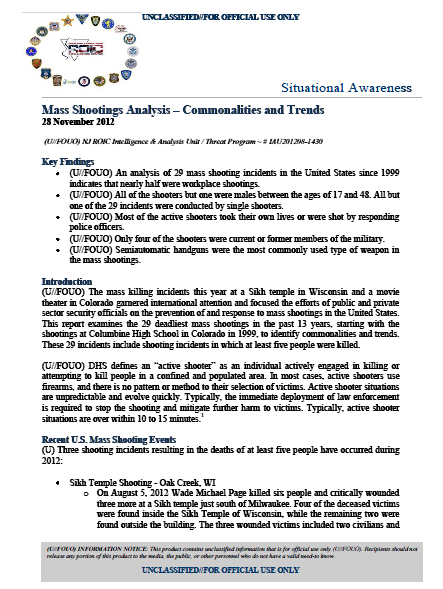 (U//FOUO) The mass killing incidents this year at a Sikh temple in Wisconsin and a movie theater in Colorado garnered international attention and focused the efforts of public and private sector security officials on the prevention of and response to mass shootings in the United States. This report examines the 29 deadliest mass shootings in the past 13 years, starting with the shootings at Columbine High School in Colorado in 1999, to identify commonalities and trends. These 29 incidents include shooting incidents in which at least five people were killed. (U//FOUO) DHS defines an “active shooter” as an individual actively engaged in killing or attempting to kill people in a confined and populated area. In most cases, active shooters use firearms, and there is no pattern or method to their selection of victims. Active shooter situations are unpredictable and evolve quickly. Typically, the immediate deployment of law enforcement is required to stop the shooting and mitigate further harm to victims. Typically, active shooter situations are over within 10 to 15 minutes. (U//FOUO) An analysis of 29 mass shooting incidents in the United States since 1999 indicates that nearly half were workplace shootings. (U//FOUO) All of the shooters but one were males between the ages of 17 and 48. All but one of the 29 incidents were conducted by single shooters. (U//FOUO) Most of the active shooters took their own lives or were shot by responding police officers. (U//FOUO) Only four of the shooters were current or former members of the military. (U//FOUO) Semiautomatic handguns were the most commonly used type of weapon in the mass shootings. Males between the ages of 17 and 48 conducted all of the attacks but one. The largest number of mass shootings – 13 of the 29 – occurred at the workplace and were conducted by either a former employee or relative of an employee. All of the active shooters were single attackers, with the exception of two students who conducted the shootings at Columbine High School. In most of the incidents – 20 of the 29 – the active shooters took their own lives or law enforcement was forced to shoot and kill them, thus leaving their true motives uncertain. In only four of the 29 incidents were the shooters active or former members of the U.S. military. 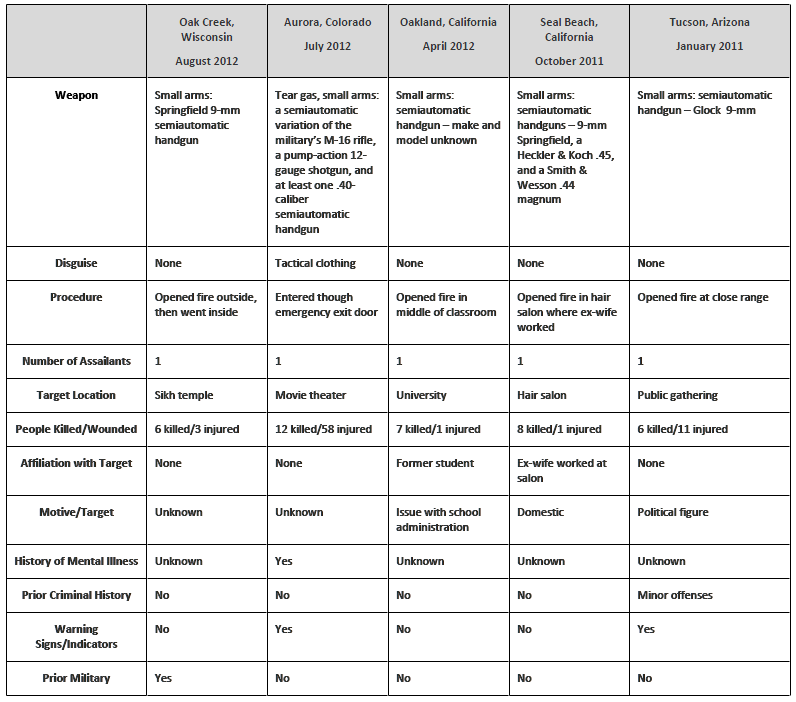 Semiautomatic handguns are the weapon of choice for mass shootings. (U//FOUO) Following the tragedy that occurred at Virginia Tech in 2007, the U.S. Department of Homeland Security released a document with recommendations on what to do in the event of an active shooter situation. The most critical recommendation is for both law enforcement and the private sector to have training and conduct drills in order to be prepared for an active shooter incident. Increased use of alcohol and/or illegal drugs. Unexplained increase in absenteeism; vague physical complaints. Noticeable decrease in attention to appearance and hygiene. Resistance and overreaction to changes in policy and procedures. Repeated violations of company policies. Explosive outbursts of anger or rage without provocation. Paranoid behavior or utterances (“Everybody is against me”). Increasingly talks of problems at home. Escalation of domestic problems into the workplace; talk of severe financial problems. Talk of previous incidents of violence. Empathy with individuals committing violence. Increase in unsolicited comments about firearms, other dangerous weapons and violent crime.